The guide will show you how to use CuteFTP to connect to your slot here at Feral via FTP/SFTP. It shouldn't require any expertise to use, but it might be helpful to read the general FTP/SFTP guide first or if you encounter a more general problem. First of all you'll need to download and install CuteFTP according to its instructions. If you don't already have the software you can find a download link in the External links section at the bottom of this guide. Open CuteFTP, click on File, hover over New and select SFTP (SSH) Site.... A Site Properties window will open. 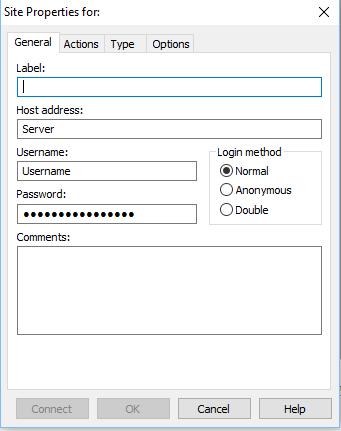 Give your connection a label, then put in your server/hostname, username and password which we obtained from the slot's Software page. You won't need to add a port number to the hostname, as CuteFTP will automatically use the default port. But, if you want to, click the Type tab and enter a port number there. Your two options are 22 or 22222. Once connected you'll see your local directory structure to the left and your slot's folders in the right-hand panel. To download, just select the download location from the left-hand side and drag your folder/files over. If you want to download using multiple segments, you'll need to right-click the data to be downloaded, hover over Download Advanced, then Multi-part Download and select MAX. See the section below for configuring multisegmented downloading. The Pro version of CuteFTP allows you to download files in multiple segments. This can help increase transfer speeds so is something worth trying if your downloads are not reaching your maximum speeds. If you've decided to connect via FTP, you can view hidden files and directories by selecting your connection from the Site Manager and pressing Alt + Enter. This will bring up the Site Properties. On the Actions tab, click on the Filter... button. Check/tick the box named Enable server side filtering and enter -a in the Remote filter box. To get into the options for handling incomplete transfers, press Alt + 7 then click on Smart Overwrite on the left-hand side. It's listed under Transfer. Once this is done, click on ADD >> and then OK.